Modern Arts Midtown (MAM) will show full-time sculptor Chris Cassimatis In September. The exhibit, opening at 36th and Dodge Street on Friday, Sept. 4, from 6—8 p.m. features table-top sized, rather than the larger scaled stone and metal works he has shown at MAM previously. Cassimatis remains within the classical sculpture lineage with carefully refined metal parts he has milled for specific applications along with shaped stones, which respond to this same elegant craftsmanship. 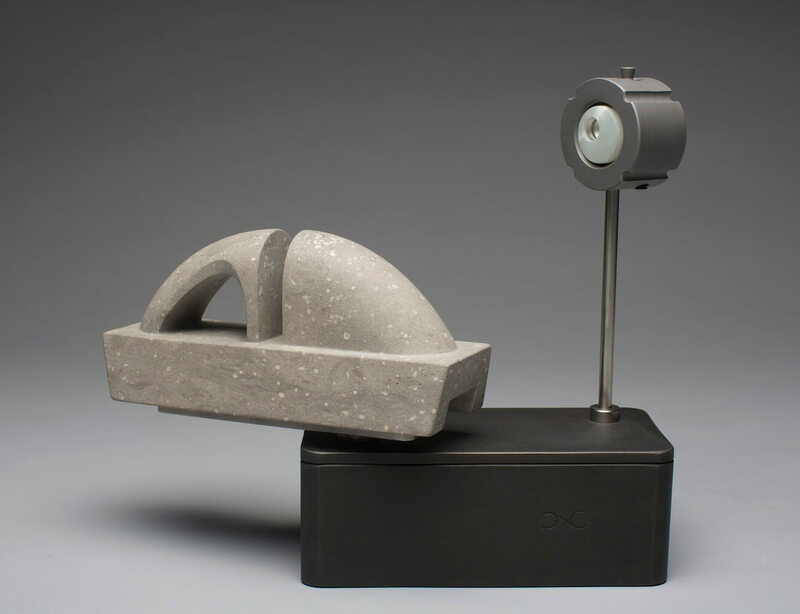 This “Still Life Series” also incorporates glass lenses with the stone and steel, adding a third element to suggest visual distortion to the work—another way of seeing. This new work offers the viewer a modern aesthetic that pleases our contemporary expectation for precise elegance. Cassimatis earned a B.A. in Art from the University of Oregon, and has exhibited in Portland, St. Louis and Omaha. Omaha sculptor Littleton Alston will also be featured with his Alexander Calder-referenced stabiles. Each seems to shape the air around them. These all black steel pieces might remind the viewer of passages in music, as well as please the eye. Gallery owner Larry Roots will use non-objective paintings from the MAM collection to give a background weight and finish to this thoughtful and harmonious exhibit.